When I was in college, I knew a guy who was really into comics -- DC comics in particular -- and he decided to bring a significant portion of his collection with him to keep in his dorm room. While certainly an odd decision, I didn't complain, as it afforded me the opportunity to read a lot of comics I'd never seen when they were released. Partly this was because I hadn't been all that interested in comics as a kid (with a few rare exceptions, mostly Marvel) and partly this was because the comics that seemed to be readily available in my neck of the woods were pretty straight forward superhero ones. Although I knew of the existence of comics like Savage Sword of Conan, I didn't regularly see copies of it at any of the drugstores where the neighborhood children bought their comics. 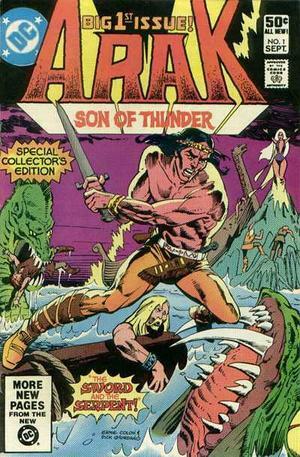 On the other hand, I'd never even heard of Arak, Son of Thunder when it debuted in September 1981. Amusingly, the comic was created by Roy Thomas (along with Ernesto Colón), creator of the aforementioned Savage Sword of Conan and there's a superficial similarity between the two comics. Both feature clever, muscular wanderers who have adventures in an ancient/medieval world. The similarities largely end there, though. Whereas Savage Sword is set in the fictitious prehistorical world of the Hyborian Age, Arak takes place in the real world of the late 8th and early 9th centuries. Admittedly, this "real" world is a legendary one, replete with magic, monsters, and Charlemagne's paladins, but it wasn't wholly imaginary in nature, even if it did play fast and loose with history in the interests of a good story. Arak's "gimmick" was that its titular character was an American Indian (from a fictitious East Coast tribe) cast adrift in a canoe as a child -- by his father, the thunder god, He-No -- and then picked up and raised by Vikings. Though his real name was Bright-Sky-After-Storm, the Vikings renamed him Erik, which he mispronounced as Arak, giving rise to his nom de guerre. As recounted in the first issue of his comic, Arak spends his early life raiding with his adoptive people, becoming a great warrior, especially skilled with the axe and the bow. During a raid on a monastery, the Vikings find themselves attacked by a monstrous serpent sent by the sorceress Angelica of Albracca (who becomes the comic's primary antagonist). Arak slays the serpent by means of a hammer-shaped cross, leading one of the surviving monks to opine that Arak has a divine mission. Arak himself wonders what god it was, if any, who aided his victory and sets off to find his destiny. From then on, Arak wanders, for a time settling in one place, but eventually moving on as he continues his personal quest to discover the truth about himself and his dimly-remembered past a continent away. For most of the early issues, Arak is in Frankland, as part of the court of Charlemagne, fighting side by side with his famous paladins against a variety of magical and mundane foes. Among the paladins was the female warrior Bradamante, whose daughter, Valda, is a powerful fighter in her own right, as well as the eventual love interest of Arak. In time, Arak moves on from Frankland and has adventures all across the Old World, meeting both historical personages and mythological monsters. It is my understanding that he eventually returned to North America to be reunited with the tribe of his birth before the comic ended its run in 1985. Arak, Son of Thunder appealed to me back in college for the same reasons it does now: it's a fun take on historical fantasy with a twist. Certainly it's not very plausible historically but then neither are the tales of Conan. Still, I think Roy Thomas did a terrific job with the comic, presenting both a world and a protagonist worth reading about. It's also a good model for historical fantasy gaming, something I find myself pondering quite regularly. I have no idea how hard it is to find copies of the comic nowadays (I last saw them in the early '90s), but, if you ever come across them, they're worth a read. I collected this comic in college. I loved the fantasy-historical setting, most of which was cribbed from Ludovico Ariosto's Charlemagne romance, Orlando Furioso. I started collecting comics around 5th grade (1983 or so) with The New Teen Titans. I remember Arak but have only read a few of the comics. I really liked Warlord by Mike Grell which was almost Conan set in Pellucidar, great series! I need to go back and check out Arak, for some reason I thought he crossed over with Warlord. The cover to that comic is somewhat similar to the cover on Green Ronin's Mutants & Masterminds supplement Warriors & Warlocks. Interesting. Have you had a look at Mike Grell's Warlord series? There was a Showcase Presents collection I picked up a few months back which was really good, and cheap. Arak Son of Thunder is what sparked my interest in both fantasy and medieval history and literature. I was a young teenager, and I was absolutely enthralled by the series, and waited eagerly every month for the new issue to arrive. I lived in a small town with no comic book stores, but I talked my mother into driving me into Buffalo so pick up the back issues that I had missed. I still have the series, and may sit down and reread it now that you've rekindled my interest. Open Friday: Dungeon Entry "Stat Block"